Will China Step Up on Sudan? Many human rights champions around the world have responded with anger at the news that China will be receiving Sudanese President Omar al-Bashir this week. The argument is that by hosting Bashir, a figure indicted for war crimes, crimes against humanity, and genocide, China only reinforces Bashir’s sense that there are no consequences for his brutal actions against his own people. 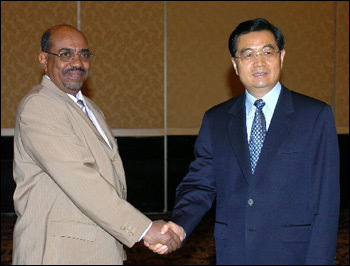 President Hu Jintao and other top government officials will personally meet with Bashir during his visit. The International Criminal Court’s warrant for Bashir has resulted in widespread international pressure on most countries around the world to close their doors to the head of state – as evidenced by the cancellation of Bashir’s recently planned visit to Malaysia. China, however, is not a party to the Rome Statute that established the ICC and is accordingly under no legal obligation to arrest Bashir upon his arrival, as some rights groups have advocated. "Both in Khartoum and Juba, I stressed that the situation in Abyei is deteriorating and both sides should exercise maximum restraint and be prepared for compromise. Regardless of what occurs, war is not an option,” Beijing’s special envoy for African Affairs Liu Guijin recently said to AP. Beyond rhetoric, however, Beijing needs to demonstrate that its pledges are backed by a real commitment to diplomatic pressure, including the outlining of meaningful consequences if Khartoum does not take concrete action to stop the violence in Abyei and South Kordofan. It would also be more productive for such interactions to take place in Sudan in the future, as allowing Bashir to travel internationally only serves to flout the efforts of the rest of the international community to isolate and pressure the regime. Why should China decide to step up to the plate? Beyond the critical human rights issues at stake, China also has pragmatic reasons to invest in the peace process. As Sudan’s largest trading partner and one that extracts a large percentage of the country’s oil, China is one of the actors on the world stage with the most leverage to exert on Sudan. A return to full-scale war and the prospect of perpetual conflict will do little to help China’s businesses interests in the region. The Chinese have a tremendous stake in the future stability of North-South relations in Sudan, with their significant investments in the oil sector straddling the soon-to-be international border between the two countries. When news of Bashir’s China visit circulated at Enough’s office, our executive director John Bradshaw remarked: "China should rescind this morally repugnant invitation and should instead begin working constructively to help increase diplomatic pressure for a final resolution to the dire situations in Abyei and South Kordofan.” Now that it appears Bashir’s trip is going ahead, here’s to pragmatically hoping China puts its significant economic leverage over the Sudanese leader to good use.